Its report also calls rocket attacks by Palestinian militants war crimes and accuses Hamas of endangering civilians. The Israeli military says its conduct was in line with international law. Israel has attributed some civilian deaths to \”professional mistakes\”, but has dismissed wider criticism that its attacks were indiscriminate and disproportionate. 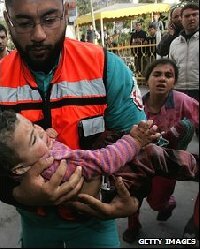 In March, Israel\’s military said the overall Palestinian death toll was 1,166, of whom 295 were \”uninvolved\” civilians. The 117-page report by Amnesty International says many of the hundreds of civilian deaths in the conflict \”cannot simply be dismissed as \’collateral damage\’ incidental to otherwise lawful attacks – or as mistakes\”. It says \”disturbing questions\” remain unanswered as to why children playing on roofs and medical staff attending the wounded were killed by \”highly accurate missiles\” whose operators had detailed views of their targets. Lives were lost because Israeli forces \”frequently obstructed access to medical care,\” the report says. It also reiterates previous condemnations of the use of \”imprecise\” weapons such as white phosphorous and artillery shells. The destruction of homes, businesses and public buildings was in many cases \”wanton and deliberate\” and \”could not be justified on the grounds of military necessity\”, the report adds. \”All of those things occurred on a scale that constitutes pattern – and constitutes war crimes,\” Donatella Rovera, who headed the research, told the BBC. Israeli officials responded saying the military targeted only areas where Palestinian militants were operating, and accused Hamas of turning civilian neighbourhoods into \”war zones\”. \”We tried to be as surgical as is humanly possible in a difficult combat situation,\” Israeli government spokesman Mark Regev told the BBC. The Amnesty report says no evidence was found that Palestinian militants had forced civilians to stay in buildings being used for military purposes, contradicting Israeli claims that Hamas repeatedly used \”human shields\”. However, Amnesty says Hamas and other Palestinian militant groups had endangered Palestinian civilians by firing rockets from residential neighbourhoods and storing weapons in them. It says local residents had in one case told researchers that Hamas fighters had fired a rocket from the yard of a government school. The Israeli military has repeatedly blamed Hamas for causing civilian casualties, saying its fighters operated from buildings like schools, medical facilities, religious institutions, residential homes and commercial premises. In the cases it had investigated, Amnesty said civilian deaths \”could not be explained as resulting from the presence of fighters shielding among civilians, as the Israeli army generally contends\”. It also says Palestinian militants rocket fire from the Gaza Strip was \”indiscriminate and hence unlawful under international law\”, although it only rarely caused civilian casualties. Thirteen Israelis were killed, including three civilians, during the offensive, which Israel launched with the declared aim of curtailing cross-border rocket attacks.